SESRIC has launched the OIC Economic Outlook 2017, the flagship report of the Centre, during the 33rd Session of the COMCEC, which was held in Istanbul on 20-23 November 2017. The main highlights of the report were presented by H.E. Ambassador Musa Kulaklıkaya, Director General of SESRIC, during the meeting. 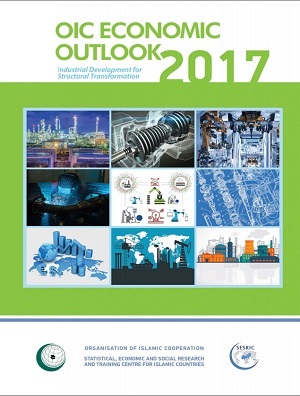 As is the case in every year, the OIC Economic Outlook 2017 analyses the trends in major economic indicators for OIC member countries as a group and investigates these trends in a comparative manner with their counterparts in the groups of developed and non-OIC developing countries as well as with the world average. Doing so, the report highlights a number of constraints and challenges confronting the efforts of OIC member countries towards enhancing their economic development and progress. This year’s report also includes a special part on industrial development for structural transformation in OIC member countries. According to the report, industrial development process in OIC countries, as a group, has been rather sluggish over the last several decades. The share of OIC countries in total world manufacturing value added increased from 4.9% in 1990 to only 7.7% in 2016. There is also a strong growth in trade deficit in manufacturing products, reflecting the inadequate manufacturing production capacity in OIC countries. Therefore, the report argues that OIC countries need to refocus their attention to economic diversification in manufacturing sector in order to narrow the gap in economic development and increase the level of economic diversification. A well-diversified economy requires a strong and sophisticated manufacturing industry in order to enhance and retain its competitiveness in the global economy. In this regards, while designing industrial policies, it is critical to understand the issues behind the successful and failed experiences of previous industrialization attempts. It is also important to create a synergy between trade and investment policies of the member countries, with particular attention given to the measures that stimulate product value chains in industrial development.